A key point for tech-transfer and innovation is financing, especially for small and medium enterprises. 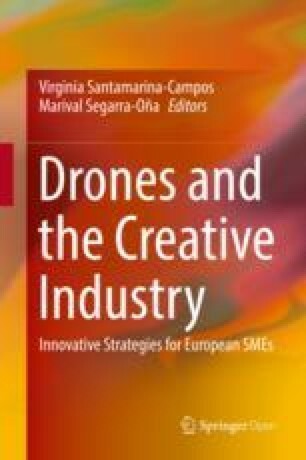 In this case, the authors explore the different European instruments of financing and how they have been applied to the creative industries. Starting from an analysis of the type of projects funded by previous European Framework Programmes for Research and Innovation and their evolution, the authors identify challenges and risks for the sector. The Creative Industries Sector (CIS) is among the most innovating sectors both in terms of technological and non-technological innovation. As for the rest of industries, technology plays a very important role in the innovation capacity of the sector. In terms of technological innovation creative industries (CI) have a twofold role, acting both as user and as provider of technologies. Moreover, CIS has an increasingly recognised role in triggering technological innovation in other sectors and in the society as a whole (Bakshi et al. 2008). CI are strong users of new technologies. According to an Austrian CI survey (Müller et al. 2009), more than 90% of creative industries use new technologies in their daily business. Additionally, according to the same survey, 46% of CI companies that acquire new technologies make contact with technology producers before acquiring it. This direct contact supports innovation of the technological sector and supports the idea that for CI it is important to collaborate with technology providers in order to assimilate technologies. As a matter of fact, 18% of CI reported that the new technology was developed specifically for them, acting also a source of technological innovation. The most demanded technologies by CI are Information and Communication Technologies (ICT) both in terms of software and hardware, but also new materials in the case of design fashion and performing arts (Müller et al. 2009). As in other industries, digital transformation has had a profound impact in CI. In terms of product development, content created by CI is, in many cases, digital or digitised; however, CIs have also invented new business models that integrate high-value content and communication technologies, both within their business and the services they provide. Some CI sectors are frontrunners in introducing consumers to the new business models of the digital era, paving the way for other sectors that are shifting services online. Together, they identify and fulfil new uses for technology and adapt to changing consumer behaviour and expectations. Finally, once seen as largely a matter of technology, innovation has evolved to embrace aesthetics, functionality and content, and CI can act as a provider of them especially in ICT technologies. According to the above-mentioned study (Müller et al. 2009), 17% of the creative enterprises provide support to Research and Development (R&D) and engineering design. Moreover, creative industries may also support innovation in the wider economy without direct interaction. A key mechanism for doing so is the mobility of the workforce, in particular when people find new jobs outside the creative industries and take their ideas, knowledge and creative potential with them and use it in other industries. There are also significant Business to Business (B2B) linkages between creative industries and the wider economy and they show that firms with a higher share of inputs from creative industries tend to be more innovative in terms of product innovations (Bakshi et al. 2008; Experian 2007; Müller et al. 2009). CI are also developers of technologies that can be applied in other sectors. A good example of this is digital gaming and animation, which is at the forefront of technology, and which has developed many technologies that have been transferred to other sectors inside and outside of CI. The enormous success of digital games in engaging users (McDonald 2017) and the possibilities that digital gaming offers in terms of information and learning has fostered the use of gaming in different areas, such as in learning and patient involvement. This fact has opened a new market for the digital gaming industry and has created a new subsector in the area of serious games. Universities can also play an important role in this ecosystem of innovation and technology transfer from and to CI. As with any sector, universities have a double role regarding creative industries, namely training and education, but also as technology developers. Successful innovation in CI most often requires the combination of a firm’s own innovation resources with external inputs. Universities can provide those inputs in the form of knowledge (e.g. developed technologies, insights from studies, etc.) or specialised R&D services. CI demand for new applications, especially in the area of ICT, can provide a major stimulus for innovation on the side of the technology producers, such as universities. Technology-based innovation in CIs is rather complex. Despite the already mentioned use of new technologies, within CIs there is a generalised lack of knowledge of technologies that could be applied for the benefit of creative industries both from the side of technology providers/research groups and from the side of CI. Although some technologies, such as Virtual Reality (VR) and Augmented Reality (AR) have been widely applied in many CI sectors, there is a wide diversity of technologies that could be applied to increase the competitiveness of CI that are not recognised as such. This is especially important when we talk about very small firms of small and medium enterprises (SMEs) and technologies that are not as “popular” as VR and AR. Moreover, there is a range of already developed technologies that cannot be fully exploited for CI due to the lack of adaptation of their particular needs and workforce skills. In some cases, technology-based innovation in CI is more about adoption than about development (Universities UK 2010). This is typical for many SME sectors and there are examples, such as in manufacturing, where big efforts are being made to put the technology in the hands of the SMEs by delivering specialised tools and infrastructures. The particularities of CI make necessary for this adaptation to be tailored to the specificity of the different CI subsectors. One of the reasons of this lack of knowledge and adaptation of technologies is the lack of sectoral collaboration between CI and other sectors and even the lack of structured R&D collaboration within the CI. If we compare the situation of CI in Europe with that of many other sectors such as manufacturing, construction or energy, the connection between researchers and industry is very scarce and much less structured. The exception is the New European Media Initiative’s platform (NEM) that has recently assumed the CI sectors and created a working group about CI. In relation to universities, in most cases, education and R&D structures, such as research groups, are focused either on technological areas, such as ICT, chemistry, physics, etc., or on application areas, such as industrial sectors or arts. The multidisciplinary approach and the combination of Arts and Technology as required by many CI has been traditionally scarce. Besides, in many cases, universities focus more on linear than on collaborative processes, which are required to work with CI (Universities UK 2010). This imposes difficulties for both the technology transfer and education/training role of Universities regarding CI. Framework Programmes (FP) for Research Technology Development have been, during the last few decades, the main source of Research and Development Collaboration among the academy and industry at the European level. Horizon 2020 (H2020) is the running Framework Programme for Research and Innovation, which was launched in 2014 by the European Commission. Horizon 2020 is structured under three pillars: Excellent Science (ES), Societal Challenges (SC) and Industrial Leadership (LEIT) together with other areas, such as Science with and for Society (SWAFS) and Spreading Excellence. For the first time, it combines research and innovation in a single programme under a holistic approach to innovation that can, at the same time, tackle societal challenges and give rise to new competitive businesses and industries. Under this approach, innovation has a broad definition, which is not only limited to the development of new products and services on the basis of scientific and technological breakthroughs. Under the innovation approach of H2020 there is a particular emphasis on supporting activities which operate close to the end-users and the market, such as demonstration, piloting or proof-of-concept. According to this approach, different types of projects, called instruments, are funded by H2020. On one hand, the Research and Innovation Action (RIA) instrument covers the activities that explore the feasibility of a new technology process or product and the testing at a small scale in laboratory or simulated environment. On the other hand, Innovation Actions (IA) cover the activities of adaptation and demonstration in operational environment of a new, but already existing, technology for a given application. Complementary to this, another type of project called Coordination and Support Action (CSA) is directed at activities such as networking, awareness raising, mutual learning exercises and strategic planning. It is important to mention that in Horizon 2020, as well as in the previous FP6 and FP7 programmes, the calls for proposals are quite restrictive. The calls include a number of topics that determine the technologies and applications that will be funded. This implies that, in some way, the support given to a technology and sector is predetermined by the description of the topics. The support given to CI by the different European Framework Programmes, according to CORDIS database, shows a clear evolution (Fig. 1). FP5 (1998–2001) only funded one project, while in FP6 (2002–2007) only two projects were funded. The support to CI increased significantly in the period 2008–2013 under FP7, and the (CIP), which was a complementary Programme focused on innovation. In total 35 projects were funded in that period, 26 under FP6 and 8 under CIP. On the other hand, as can be seen in Fig. 1, the number of projects funded under H2020 (2014–2020) has increased exponentially. 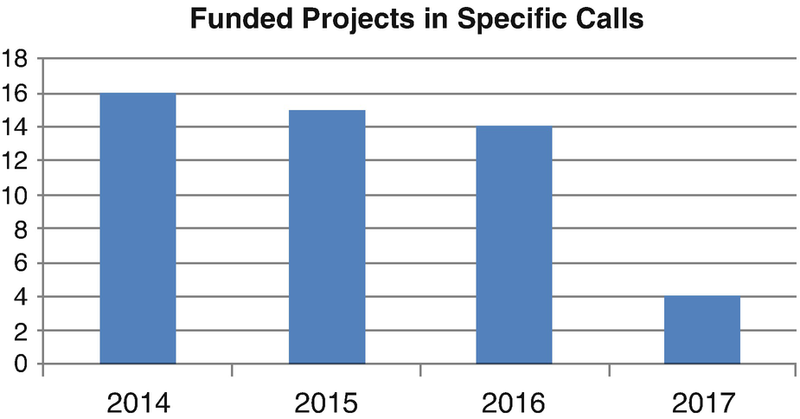 Even before finishing H2020, by 2017 100 projects were already funded. 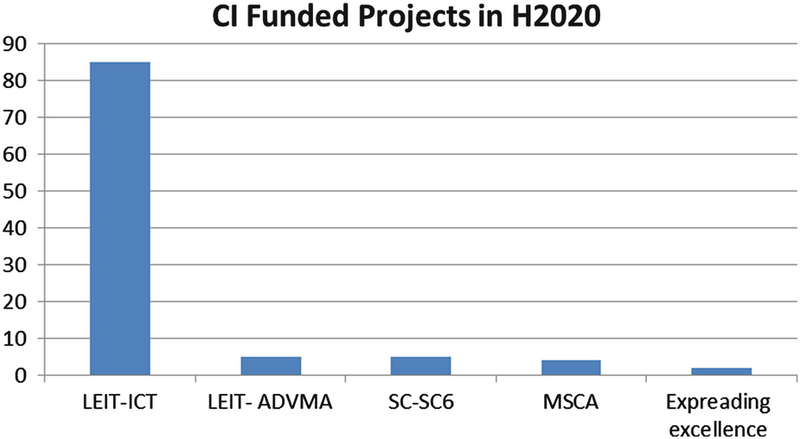 If we analyse the area of H2020 in which the projects were funded (see Fig. 2) we can see that most of the projects correspond to calls of the Leadership in Enabling and Industrial Technologies (LEIT) and in particular in the area of ICT with a total of 85 projects funded by 2017. The diversity of ICT technologies in projects related to CI that were funded by H2020 is very broad, covering among others: Visualisation, Language Technologies, Multimodal and Natural Interaction, Big Data for Content Management, Content Creation and Annotation, Serious Games for Learning, Wearable technologies and the impact of Future Internet among others. The projects covered both Research and Innovation Actions (RIA) and Innovation Actions (IA). The other areas with funded projects include the one in LEIT about Advanced Materials (ADVMA) and the Societal Challenge 6 “Europe in a changing world-Inclusive, innovative and reflective societies”, where most of the research about cultural heritage and cultural industries is included. Both areas funded five projects each, before 2017. This distribution of funded projects on ICT and materials technologies corresponds to the already mentioned results of Müller et al. (2009) regarding the impact of technologies in CI, and also reflects the support given to CI for the different areas of H2020 in terms of the scope of the launched calls for proposals. It is also worth mentioning that only four projects in total were funded under the Marie Slodowska Curie Actions (MSCA). This MSCA scheme is devoted to improving mobility of researchers. Of those four MSCA CI projects funded, two of them were RISE, which support the interchange of personnel among academy and industry, and two of them were individual fellowships. No project was funded under the International Training Network (ITN) scheme whose objective is to raise excellence and structure research and doctoral training in Europe, extending the traditional academic research training setting. ITN scheme is open to any area of research but, as data about submitted proposals are not available, it is impossible to know if no proposals were submitted or if the proposals submitted did not succeed in receiving funds. In 2014, 2015, 2016 and 2017, specific calls were launched for the support of the creative industries inside of the LEIT-ICT area of Horizon 2020. 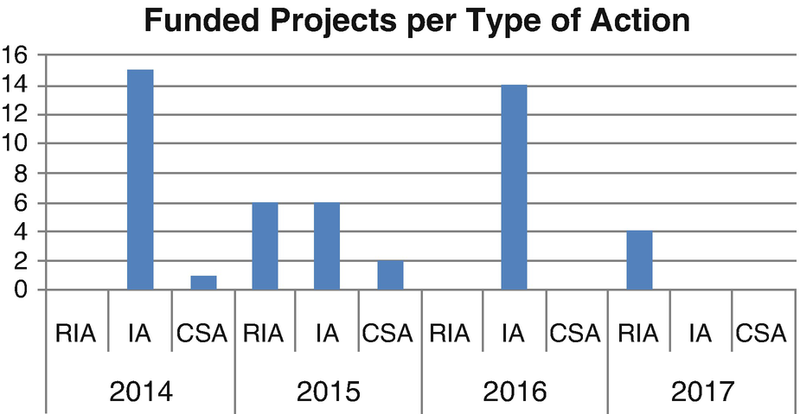 This specific activity funded 49 projects in total, including RIA and IA actions, according to the budget allocated to each type of instrument. In Figs. 3 and 4, the number and type of projects funded per year are presented. As can be seen in Fig. 3, the number of funded projects has decreased over the years. This is due to a combination of a reduction of budget and the mean budget per project (see Figs. 5 and 6). As can be seen in Fig. 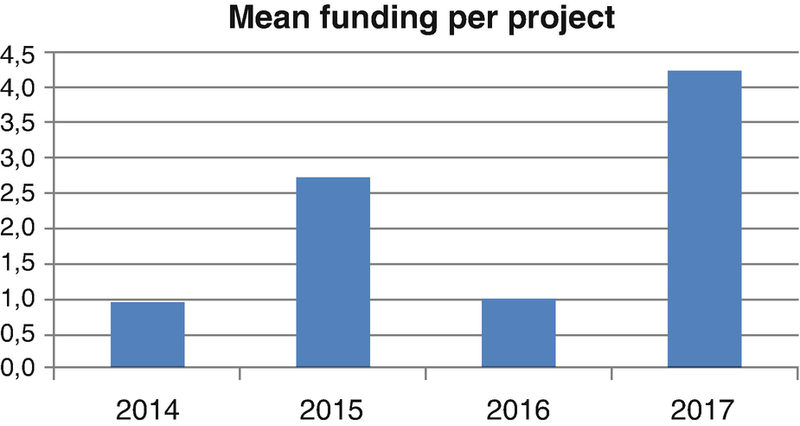 4, in 2014 and 2016, the number of funded projects was quite high, even when the budget was similar to that of 2017 (Fig. 5). This is due to the fact that the calls of these years included topics for small Innovation Projects with low budgets of around 1 million euros. These topics were specially designed to increase the competitiveness of CI by launching to the market products and services based on technologies that have reached a level of demonstration in a relevant environment (Technology Readiness Level 6). The project itself should adapt the technology to the special needs of creative industries and develop the necessary industrialisation and demonstration to surpass the so-called “Valley of Death”. This term is a metaphor that illustrates the challenges faced by a company (normally a spin-off company) to go from a functional prototype to a fully-fledged profitable business. This term is used mainly in the case of spin-off companies, but can also be applied to products and services developed by any SME and can be perfectly applied to CI SMEs. In Horizon 2020, this concept of “Valley of Death” was at the core of the creation of the Programme as focusing on Research and Innovation. As a matter of fact, some specific actions were designed to help SMEs to surpass this “Valley of Death”. These specific instruments are the so-called SME Instruments, and in some way they are also the Fast Track to Innovation. These types of projects are Innovation Actions conceived of as bottom-up actions in the sense that the calls are open to very broad objectives and technologies. Although SME Instrument and Fast Track to Innovation could, in principle, have been a good opportunity for CI, in the period from 2014 to 2017, only three CI projects among 3200 were funded under this scheme. Besides, no IC project was funded under the Fast Track to Innovation Scheme. As the information about the submitted proposals is not available, we cannot know if the reason for this surprising result is that few proposals were submitted or if these proposals were not able to compete with those from other sectors. In this context, the specific support of H2020 funding small projects very focused in the transfer of technology to the CI is remarkable. In particular, the strong support of the ICT area of Horizon 2020 has to be recognised. In 2012, a “Creativity” unit was set up in 2012 following a reorganisation of Directorate-General CONNECT Communications Networks, Content and Technology (DG CONNECT). The unit was part of Directorate G: Media & Data. Until 2016, this Creativity Unit supported ICT-related research and innovation for CI and research on creative processes involving ICT. Nevertheless, in 2016 a reorganisation of the DG CONNECT led the Creativity Unit to be transformed into a new one that deals with a broader area for Data Applications and Creativity. 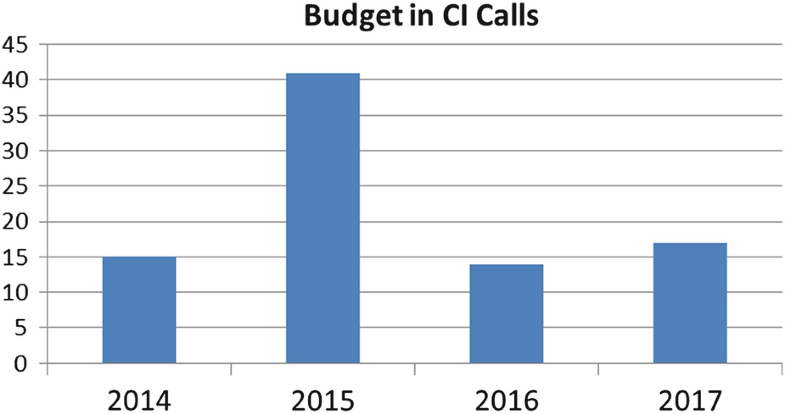 Additionally, the specific calls for CI have disappeared from calls for proposals 2018–2020. For this final period of H2020, the calls in which CI are mentioned are not specific to them and CI have to compete with other sectors that have a much longer tradition of securing R&D EU funding, such as manufacturing and health. These other sectors are also much more structured and involve big companies that have been Key Players of European Research for decades. This scenario implies the risk that, if the special needs of CI are not taken into account, CI sectors will lag behind in terms of technological innovation and technology providers will lose CI as a potential market. In terms of research and development, many challenges have to be overcome in order to foster technological innovation in CI. There is a lack of awareness in academia about the possibilities for the CI as potential users of a great diversity of technologies, and in particular, digital technologies. Moreover, there is also a lack of knowledge in many CI about the technological possibilities that can be applied to the sector, especially in the case of small SMEs. As a consequence, there are no clear roadmaps of R&D required for CI that can guide the creation of R&D roadmaps in research groups or funding organisations. To be effective, appropriate funding for CIs’ technological innovation should be reinforced by mechanisms that are able to reach to such a disperse sector. This has deep implications for innovation policy: no longer is it sufficient to support the creative industries alone and for their own sake, policy should encourage and embed linkages between them and the wider economy. But there are not only R&D challenges to face. Skills are maybe the most crucial input to industrial innovation, but skilled and talented people are a key element for a firm’s potential to absorb external knowledge. A crucial part of the innovation-stimulating and supporting potential of the creative industries certainly lies within the human capital of their workforce. Nowadays, a strong demand in terms of education and R&D has arisen from the growth of the CI sector. This has led to many private and public universities developing education offers in multidisciplinary grades and master’s level courses that are focused in covering needs of CI. In addition, multidisciplinary research groups that have the potential to develop technologies and create contents specifically conceived for the use of CIs have recently appeared. Nevertheless, although in some areas, such as in video gaming, several training programmes have been developed, there still exists a gap between the artistic and the technological training programmes at grade and master’s levels, not to mention in doctorate degrees. To cover this gap, Mixed Art-Technology Programmes focused on the needs of CI should be developed, including at the doctoral level. The support of Research and Development Programmes is key to boosting the competitiveness of any sector, but they are even more crucial for very important, but not so well structured, sectors such as CIS. From a European perspective, the recognition and support that has been given to the sector by the European Commission and in particular in the ICT area (DG CONNECT) has to be acknowledged. Nevertheless, there is still a lot to do and the new approach of the WP2018–2020 has the risk of once again leaving CI far behind other sectors in terms of support for the development of new technologies and products and the corresponding innovation activities. In addition, the low number of projects funded under bottom-up actions, such as SME Instrument, FTI or MSCA actions, should be carefully studied to know the reasons why. In this sense, actions should be taken to improve the participation of CI SMEs that want to incorporate new technologies in their innovation processes or products. Besides, actions should be taken to foster the development of innovative doctorate training programmes under the MSCA scheme for the benefit of CIS.